How to open a PDF form file that says Please wait…? 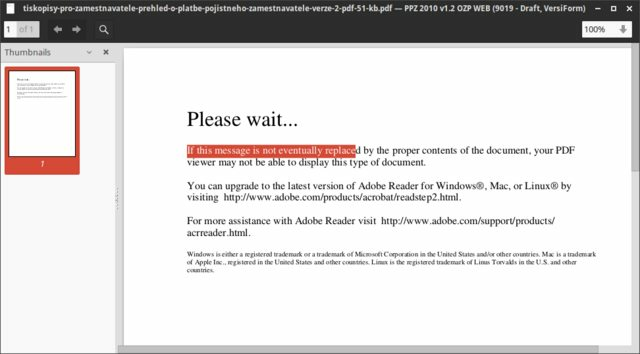 You can upgrade to the latest version of Adobe Reader for Windows®, Mac, or Linux® by visiting http://www.adobe.com/products/acrobat/readstep2.html. For more assistance with Adobe Reader visit http://www.adobe.com/support/products/acrreader.html. Certain PDF files (dynamic XFA forms) created in Adobe LiveCycle can only be opened in Adobe Reader and Adobe Acrobat. When you try to open these files in an alternative PDF viewer, then you will see this error message. How are such files meant to be opened on Ubuntu given the official Adobe Acrobat Reader package is deprecated? It's not a real problem for me practically as I have actually managed to install Adobe Acrobat Reader 9 (BTW I am, however, afraid this ancient version is going to start having problems with opening new files of this kind soon) on XUbuntu 15.10 a reasonably tidy way by unpacking the old Ubuntu DEB package, putting the necessary files to a subdirectory in /opt and editing the Reader's launch scripts but I believe it's a pretty serious issue for using Ubuntu in commercial/academy/government environments so there is to be a more proper way. Try Master PDF Editor (proprietary). The free version is good for viewing, but for editing probably not (I read that it leaves watermarks). You can also use the outdated, unsupported, probably very insecure, old Adobe Reader 9 for Linux. Editor’s note: XFA forms have been deprecated from ISO 32000-2 in accordance with the outcome of the letter ballot following the Pretoria meetings. As explained at 3 Alternatives to the Adobe PDF Reader on Linux | Linux.com | The source for Linux information, features like Extended form filling (such as XFA Forms) and Embedded 3D models won't work in most open source implementations. So I suggest pushing back to the people producing the documents, explaining that they are not accessible to people in a variety of situations, are not supported by e.g. the Chrome PDF viewer or open source viewers, and that they thus increase the attack surface and increase security risks. So they should drop use of XFA. Chrome should work BUT Chrome first needs the NotablePDF plugin to actually view the PDF. Make sure you have that plugin. That should get you smooth sailing viewing PDF via a browser. Can be found in the Chrome App Store. Okular is supposed to be one of the most stable PDF readers on Linux systems. It is the default viewer in KDE. It has a little more features than Evince, which I saw you've already tried. Not the answer you're looking for? Browse other questions tagged pdf evince adobe or ask your own question. Why can't evince open this pdf issued by my bank while adobe pdf reader can? Is it possible to open a pdf that requires Adobe Reader 8 without using acroread?